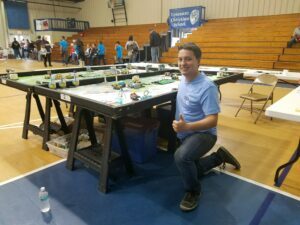 Jordin Findling, a Staff Engineer in our Panama City Beach office, loves to volunteer in his community and did so this past weekend at the Bay County First LEGO League (FLL) competition where he served as a Table Referee. Started in 2001, First LEGO League introduces students in elementary through middle school grades to real-world engineering challenges by building LEGO-based robots to complete tasks on a thematic playing service. FLL teams, guided by their imaginations and adult coaches, discover exciting career possibilities and, through the process, learn to make positive contributions to society. Jordin is looking forward to doing some more volunteering in the coming weeks at the Three Rivers Regional Science and Engineering Fair at Florida State University Panama City and the local Math Counts competition.